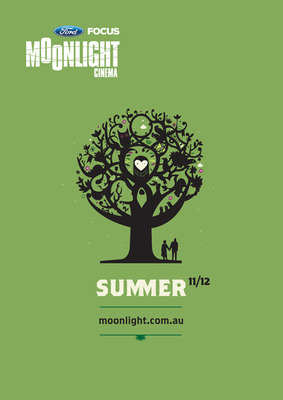 You'll be seeing stars in more ways than one at this summer's Ford Focus Moonlight Cinema in the beautiful New Farm Park from Wednesday 14 December 2011 to Saturday 18 February 2012. Settle in for some hot new releases, old favourites and sneak previews of some of the most anticipated films for next year. Your current release movie menu includes George Clooney's turn as writer, director and star of The Ides of March, the dirty politics (is there any other kind?) drama; provides some Australian flavour with Red Dog; offers some bites of Vam Rom with The Twilight Saga: Breaking Dawn - Part 1; spreads the Christmas cheer with Arthur Christmas; and then spreads the fear with Matt Damon and Kate Winslet in Contagion, curiosly the third movie to use that name - check out the other D Grade offerings at IMDB. Sneak peek previews begin with George Clooney's journey of self-discovery vehicle, The Descendants, which kicks off the program, and include the Clint Eastwood directed and critically panned biopic J. Edgar, Matt Damon (again) in the family flick We Bought a Zoo and The Muppets, already doing great box-office business in the US. Old favourites trotted out for an alfresco showing include teen flick Ferris Bueller's Day Off, and a Grease sing-along. The full program can be accessed here. Movies will screen each week from Wednesday through to Sunday during the program. Gates open at 6pm and movies start at 7pm. For your viewing comfort a limited number of bean beds can be hired for $8. Food and a full bar are available. No BYO alcohol is allowed. Limited on-site free parking is available or catch the CityCat or bus services 195, 196, 197 and 199. Ticket prices are Adults $16, Concession $14 and Seniors and Children (aged 5 to 15) $12. On Wednesdays tickets for all movies, apart from previews are $12. You can pre-purchase tickets online by clicking on the session of your choice here, or you can buy them at the venue box office from 6 pm Wednesday to Sunday. Group bookings for 20 people or more are discounted - call 1300 551 908 for details. There a few ways for you to win free tickets - Refer A Friend, News For You, and Invite a Friend. You won't be rolling jaffas down the aisles at these movies. Instead you'll be under the starry skies enjoying cinema in alfresco style. What are you waiting for? Why? Enjoy your cinema in al fresco style. Cost: Ranges from $12 to $16 - see article for details.